An unforgettable episode in a child's life and a sure nostalgic moment for adults, Disney Live! Mickey's Music Festival will bring to the stage more than 25 Disney stars we all have come to know and love! Watch Mickey, Minnie, Donald and Goofy; Ariel, Sebastian and Ursula; Jasmine, Aladdin and Genie; and Woody, Buzz, and Jessie sing and dance to famous Disney hits remixed to hip hop, pop, swing, reggae, rock, country and more! "Disney live is the first live show experience many children will have so what I want them to walk away with is an experience that they won't forget. I want them to have the best time with their parents with their siblings dancing, singing and seeing their favorite characters come to life." said Feld Entertainment Producer, Alana Feld. Disney Live! 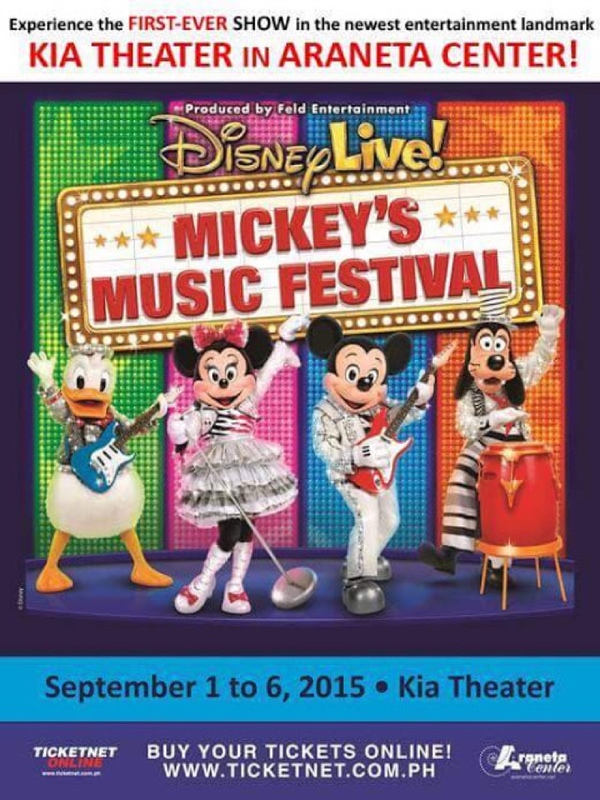 Mickey's Music Festival is the first-ever show of Kia Theatre, formerly New Frontier Theater at Araneta Center, which runs from September 1 to 6. Tickets are now available. Buy your tickets online at www.ticketnet.com.ph. Call 911-5555 for more details.